Keep track of visitors and manage traffic in your facility with one convenient book. 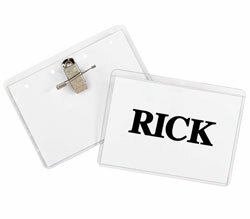 Make it easy to track visitors, while keeping them easily identified within the building. Log entries are created when a badge is filled out, and once removed, it leaves a carbon copy of the visitor's information. Expired badges reveal a highly visible color indicator that can be seen from up to 50 ft. away. To activate badge, simply peel off liner and fold tab back to underside of badge. Contains 150, 24‐hour self‐expiring visitor badges. Carbonless copy of each badge is kept in registry book for reference. Store completed registry book when all badges are used.